Usually, you will find that when talking about PBXes, they are classified in Class 4 and Class 5. So, obviously, your next question is: What is the difference between a Class 4 and a Class 5 PBX? I will try to explain as clear as possible. A Class 5 PBX deals with end-user. It provides final-user services such as Voice-Mails, Conference rooms, IVR and many another kind of services that a phone user may need. This kind of switches deals with the user interaction (SIP endpoints such as Soft/Hard phones). So, in general terms, you can state that principal client of a Class 5 PBX is end-user. It is very common to find them in the retail market. Class 4 PBX is a little different. They don't deal with end-user, but instead, they deal with other switches. If you are familiar with networking, you can see Class 4 switch as a router that is connected to other routers. Class 4 ones do not offer conference rooms, IVR or any other endpoint item; authentication is usually tied to IP rather than registration. You can find this kind of switches on the wholesale market. MariaDB Galera Cluster is a synchronous multi-master cluster for MariaDB. It is available on Linux only, and only supports the XtraDB/InnoDB storage engines (although there is experimental support for MyISAM - see the wsrep_replicate_myisam system variable). MariaDB has one of the best and easiest solutions to do a Master-Master replication: Galera. 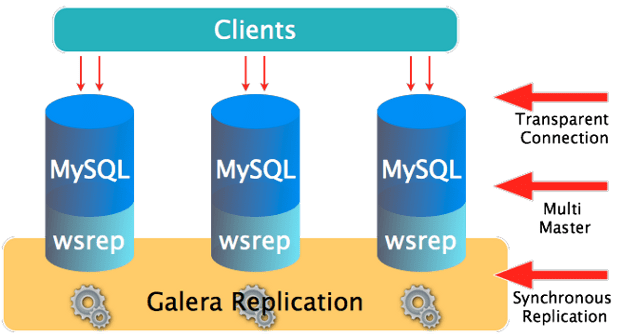 Galera uses WSREP, which it is responsible for maintaining all the Database nodes in the cluster in sync. This means, after changing one record on node A, it is just a matter of seconds to see the change on node B.
I will talk in this article how I did this configuration using MariaDB 10.1.x. Remember you can install MariaDB under Centos 6 and 7 by using OKay's repository. Since a while, the modern web browser has what it is called the cache. A web browser cache is just space on your computer where you store your latest object if those objects are requested your computer won't need to download them again, instead, it gets from the cache; local storage will be always faster than downloading from the Internet. Now think on your website, and think on all the CSS, JS and image files you are using (GIF, JPEG, PNG, WEBP, etc. ); imagine all the time that can be saved when your guesses visit the second page on your website. Apache has a very nice feature (turned off by default), that compresses the content of the page. Instead of sending the raw HTML file, it does a gzip or deflate compression and it sends a smaller file. It is faster to load a 2 kB file than a 10 kB. And as a consequence, this improves your loading time. Again, don't forget that Google rewards fastest websites, in other words, it improves your SEO. In this post, I'm going to show you how to configure the .htaccess file to maximize local cache utilization.